This polenta is meant to have a soft, porridge-like consistency. We used it for Sausage with Creamy Polenta and Kale Walnut Pesto but it would be great with any kind of stew, as a substitute for mashed potatoes or noodles. 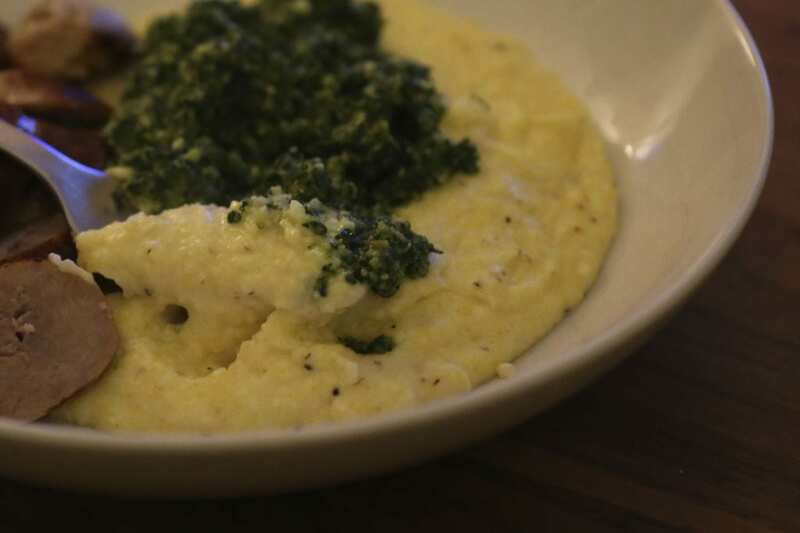 What you’re looking for is course, stone-ground, long-cooking polenta. Of course, you could use instant instead but it won’t taste quite the same. In a medium size saucepan, bring the milk, water and bay leaf to a boil. Season generously with salt (start with a teaspoon and taste until you can really taste the salt). 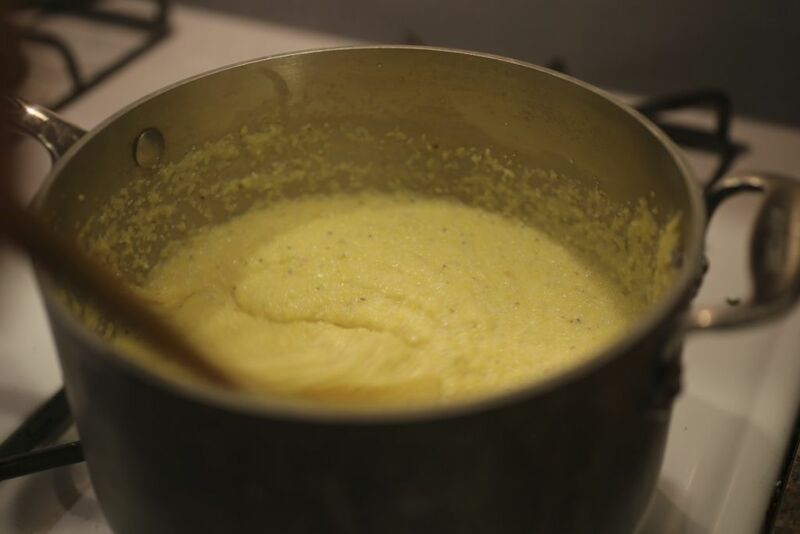 When it has reached a boil, slowly whisk in the polenta in small sprinkles. Don’t rush this step or you will end up with warm milk with a stiff lump of cornmeal in the center. Once all of the polenta has been incorporated, reduce heat to medium and start stirring with a wooden spoon. Cook the polenta for 30 to 40 minutes, adding water if the polenta becomes too thick to loosen it up. Start to taste it after 30 minutes. When it’s done, the grains will be tender instead of gritty. Remove it from the heat and stir in the Parmigiano (or Pecorino) and mascarpone. Serve it immediately, or place a sheet of plastic wrap right on the surface of the polenta to prevent a skin from forming on the top. To reheat it, add a little water and heat over low, stirring constantly to prevent burning. If you’re not in the mood to stir polenta for 40 minutes, you could substitute instant polenta which is typically ready in 5-8 minutes. It has much less flavor but is still good in a pinch. Pour any leftovers into a square baking pan. Refrigerate overnight, cut into triangles and fry in a little olive oil until it gets crisp. If you don’t have mascarpone, use a couple of tablespoons of unsalted butter instead. PreviousBrunch at The Hop. Finally. How timely. Given that I had several teeth pulled yesterday, my sinuses reconfigured with bone grafts and 4 implant posts installed, I can only eat soft food for the next few fays. The Polenta will hit the spot.